An egg is a common way to start your morning, and it is a high-protein and nutrient-dense meal. Chicken eggs are the most common components of an egg breakfast, but goose eggs can also be consumed. Goose eggs are about three times bigger than a large chicken egg, so they contain higher amounts of certain nutrients. Compare the nutrition of both types of eggs and you might be able to make more nutritious breakfast choices. If you stick to one chicken egg as part of your meal, you'll consume just 72 calories, but one goose egg contains 266 calories. There is also more fat in a goose egg than a chicken egg, including more saturated fat. One large chicken egg contains 4.75 g of total fat, with 1.56 g of that being saturated. One goose egg contains 19.11 g of total fat, with 5.1 g being saturated. If you are trying to reduce your intake of saturated fat, a chicken egg may be the healthier choice for you. A high cholesterol diet may increase your risk of heart disease so it is important to limit your intake. Eggs are one of the most well-known sources of cholesterol, and both chicken and goose eggs contain cholesterol. If you are on a low-cholesterol diet, speak with your doctor about whether or not any kind of egg has a place in your diet. One large chicken egg contains 186 mg of cholesterol, and one goose eggs contains 1,227 mg of cholesterol. Both chicken and goose eggs supply you with beneficial vitamins. One chicken egg provides 24 mcg of folate, 0.45 mcg of vitamin B12, 270 international units of vitamin A and 41 international units of vitamin D. Goose eggs, because of their size, contain larger amounts of these vitamins. One goose egg has 109 mcg of folate, 7.34 mcg of vitamin B12, 936 international units of vitamin A and 95 international units of vitamin D.
Chicken and goose eggs provide a hefty dose of certain minerals, including phosphorus. Phosphorus is a mineral that supports bone health. One large chicken egg contains 99 mg of phosphorus, and one goose egg contains 300 mg. One large chicken egg also provides you with 28 mg of calcium, 0.88 mg of iron, 69 mg of potassium and 0.65 mg of zinc. One goose egg has 86 mg of calcium, 5.24 mg of iron, 302 mg of potassium and 1.92 mg of zinc. 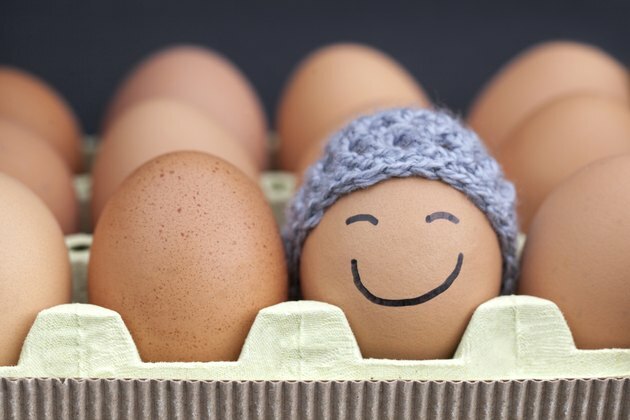 Eggs are a nutrient-dense of protein, which can help supply your body with energy. Get enough protein in your diet and you may also find it easier to lose weight or maintain your weight. One large chicken egg supplies you with 6.23 g of protein. One goose egg contains 19.97 g of protein.